Youngsters in Wales are going crazy for a Welsh language drama series about a brother and sister who have superpowers. Deian a Loli, produced for S4C by Cwmni Da in Caernarfon has proved a huge success, with a second series soon to be hitting the screen. The series recently won a Bafta Cymru award as the Best Childrens Programme in Wales. Deian and Loli are mischievous twins, who are able to freeze their parents while they go off on magical, fantastic adventures. 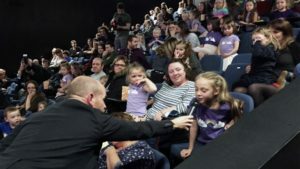 A special screening, featuring two episodes from the forthcoming series, took place in Pontio cinema, Bangor recently, with over 600 seats being snapped up in just a few hours. Due to unprecedented demand, two extra showings were scheduled. 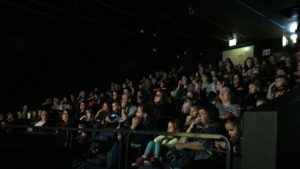 This followed an earlier premiere which was held at the National Eisteddfod in Anglesey, when demand was so great that the showing had to be moved to a bigger venue and where an extra showing had to be scheduled. Demand has also been high for merchandise from the series. T-shirts, sold online at adrahome.com and in their shop in Glynllifon, have sold in their hundreds, with a DVD of the first series also selling extremely well in bookshops across Wales. Many young fans wore their tee shirts to the Premiere. Tickets for the premiere all sold out, but you can catch the latest adventures of Deian a Loli on the Cyw platform on S4C when the new series begins on 25 October. There will also be a special episode – ‘Deian a Loli a’r Peiriant Amser’ (‘Deian and Loli and the Time Machine’) which will air on New Years Eve.